Golmaal Again trailer to be released on September 22! 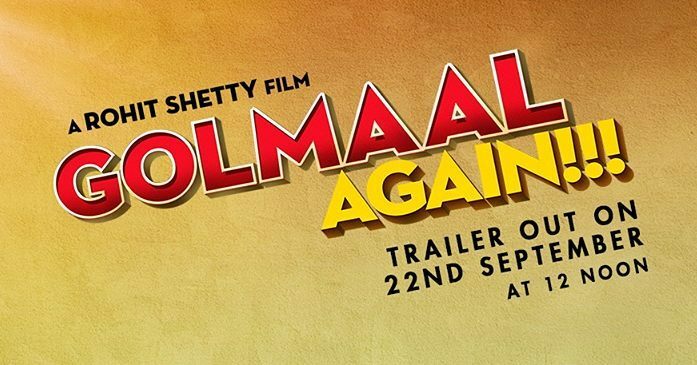 The wait is over as the makers of Golmaal Again have announced the release date of the trailer. Golmaal Again trailer is ready to be released on September 22, 2017. The film stars Ajay Devgn, Tabu, Arshad Warsi, Parineeti Chopra, Tusshar Kapoor, Shreyas Talpade and Kunal Khemu and is expected to be a laugh riot. Tusshar Kapoor and Ajay Devgn have been a part of Golmaal since a long time. This time a few new faces are expected to make things even better for the audience. Tabu and Parineeti are the new members on board and the film is ready to be released this Diwali on October 20, 2017.